Amongst the nations in the Pacific, to select a few, the Philippines, China, Japan, Vietnam, and many of the Pacific islands have had a significant part to play in leprosy’s history. Scientists are currently investigating the spread of leprosy throughout the world by investigating the genome of M. leprae. 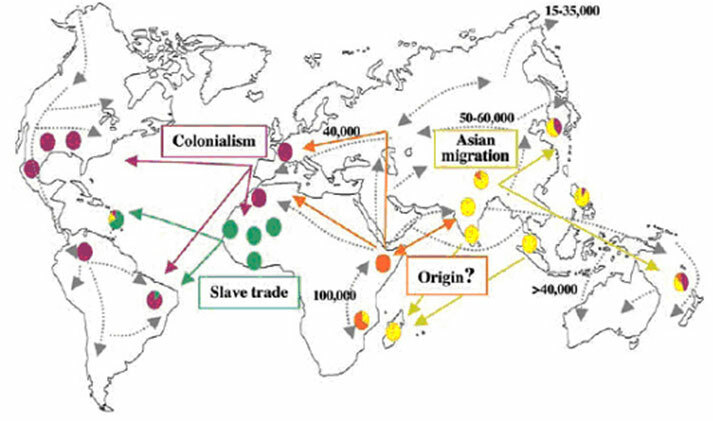 While it appears that an ancestral strain originated in East Africa about 100,000 years ago, there is also one early strain that can be identified from both China and from New Caledonia (Medum et al.). Clearly evidence from tracing strains of M. leprae and from the documentary archives, leprosy has had a long-standing presence in this very large region. Evidence of its presence is derived from ancient manuscripts or from the accounts of colonisers such as the Spanish in the Philippines or the missionaries in Hawaii or other Pacific islands. Some qualifications must be made: because disease categories have changed over time and what was once recognised as a skin disease may seem similar to what we now call leprosy, there is no hard evidence that it was actually leprosy, unless traces of the genome can be identified in paleontological evidence. The extent of the disease is always difficult to be sure about, especially in the past. This is because surveys went by different evidence. Often in the nineteenth century, for example, people with the visible stigmata of the disease would be counted as having leprosy, even if the disease had long burnt itself out in their bodies. At the same time, people who were infected with M. leprae and showed no obvious symptoms were undiagnosed. This difficulty in determining numbers was also compounded by the long incubation period between infection and visible symptoms. Even a thorough survey could wildly misrepresent the extent of leprosy in a region if estimates had been extrapolated from small local studies. There would sometimes be a cluster of infection in a small area that was not indicative of the whole region. Leprosy seemed to flourish unevenly and unpredictably. Nonetheless, there was a disease like leprosy described in ancient times in China. It was also endemic in Japan, Korea, and Taiwan. Leprosy was present in the Philippines at the beginning of the seventeenth century, at least and in some of the Pacific islands for a very long time. There seems to have been very little tolerance of people who were afflicted with leprosy, except perhaps in the Pacific islands. Certainly in China, Japan, and the Philippines, people clustered together and supplemented their living by begging. Missionaries established asylums or leprosaria for the shelter and care of leprosy-affected people. They ushered in a dimension of benevolence that inadvertently reinforced whatever stigmatising practices already existed. Importantly, local conditions to do with trade, the labour force, and national anxieties to do with fears of degeneration in the tropics, as well as fears of being perceived as a degenerate or backward nation provoked public health measures against the disease in the form of legislation and isolation of leprosy sufferers. By the 1950s, ideas about the value of isolation were finally changing as medical professionals realised what a difference the sulphone drugs were making. The attendees at the conference held in Belo Horizonte, Brazil, 1958, called for an end to compulsory isolation. They stressed that only people in need of special medical or social care should be hospitalised. In the Pacific region, health ministries of countries focussed on developing national health plans that were integrated into the plan for national development and concentrated on extending health services to the smallest health care unit. In WHO’s fourth decade (1978-1987), the regional committee adopted the primary health care strategy of “health for all”. At the same time, primary resistance to dapsone was recognised throughout in the Philippines (as one country amongst others, such as Ethiopia, India, Malaysia, Mali, and the USA). After the WHO Study Group recommended multidrug regimens in 1981, and as a result of SMHF coordination and support through training seminars, funding support, and chemotherapeutic trials, by 1991, the prevalence of leprosy in 34 out of 37 countries in the region was reduced to less than one case per 10 000 population. There are still three countries — the Federated States of Micronesia, the Marshall Islands, and Kiribati — that have a higher burden of disease. In 2010, 5055 new cases were reported in the region. The countries with a population of less than 500 000, American Samoa, Brunei Darussalam, Commonwealth of the Northern Mariana Islands, Fiji, French Polynesia, Guam, Nauru, New Caledonia, Palau, Samoa, Solomon Islands, Vanuatu, Wallis and Futuna, experience fluctuations in prevalence and case detection rates with less than 50 new cases detected annually. Out of the countries with a population of more than 1 million, Cambodia, Lao PDR, Malaysia, Papua New Guinea, Vietnam had less than 1,000 cases, and China and the Philippines had more than a 1,000. Australia, Japan, Hong Kong (China), Republic of Korea, New Zealand, and Singapore had sporadic cases. The Cook Islands, Macao (China), Mongolia, Niue, the Pitcairn Islands, Tokelau, Tonga, Tuvalu had no new and no prevalent cases in 2010. In 2015, the region is currently pursuing the Global Strategy for Further Reducing the Leprosy Burden and Sustaining Leprosy Control Activities. This involves detecting the disease as early as possible, treating with MDT, making sure that diagnosis and treatment are available through the general health system, and getting to the most marginalised communities. *1 These are American Samoa, Australia, Brunei Darussalam, Cambodia, China, Cook Islands, Fiji, French Polynesia (France), Guam (USA), Hong Kong (China), Japan, Kiribati, Lao People’s Democratic Republic, Macao (China), Malaysia, Marshall Islands, the Federated States of Micronesia, Mongolia, Nauru, New Caledonia (France), New Zealand, Niue, the Commonwealth of the Northern Mariana Islands, Palau, Papua New Guinea, the Philippines, Pitcairn Islands (UK), Republic of Korea, Samoa, Singapore, Solomon Islands, Tokelau (New Zealand), Tonga, Tuvalu, Vanuatu, Viet Nam, and Wallis and Futuna. C. J. Austin, Leprosy on the Island of Nauru, Noumea, South Pacific Commission, April 1952, p 2. George W Bray, “The Story of Leprosy at Nauru” Proceedings of the Royal Society of Medicine March 6, 1930.